Come and sail the East Coast, beautiful countryside and quiet waters. This is a good weekend for new comers to sailing and experienced sailors alike. 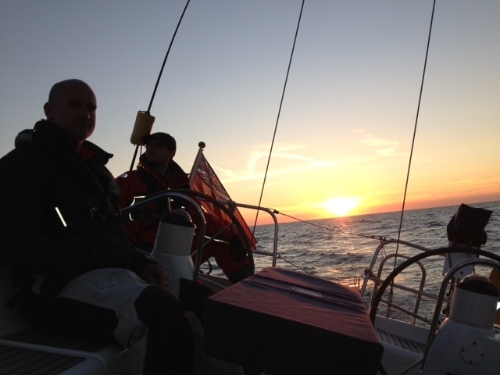 We incorporate any sail training or navigation exercises you wish or you can just sit back and enjoy. What to expect ? You join the yacht at Ipswich Marina at 10am on Saturday you will meet the skipper and up to 4 other crew. The other crew may be first timers, or doing a weekend sail like you. You will be shown around the boat, allocated a cabin and, after a safety briefing you will be involved sailing the yacht from the beginning you will be helming the boat down the river. You will spend a day at sea ‘learning the ropes’, steering the yacht, set and trim sails, tack and gybe, if you have experience tell the skipper if there is something that you want to practice or do! On Saturday night you will find yourself perhaps at anchorage, or alongside. Dinner is on-board. you will sleep well that night ! An early-ish start for an FUN sail back to Ipswich finishing about 1530 on the Sunday. All meals on board ,moorings, fuel are included in the price. Gore-Tex Oil skin water proofs are available free of charge. Thank you for a brilliant weekend I thoroughly enjoyed it. It was nice to have a bit wind and great company. I appreciated in particular mooring under sail which was good fun with the wind. The discussions you instigated were informative and delivered intelligently, professionally & as host you have no second.